I always wanted a Voskhod, I've wanted one since 2000. But to find one is hard. The Voskhod is rather rare, which is suprising since about 50.000 were made. But there is a rule that applies to the Voskhod. Finding one is hard, but finding a working Voskhod with its selenium cell intact is even harder. 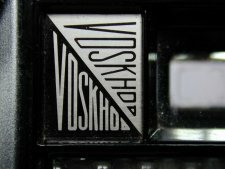 Voskhod, in short is nothing more than a souped up viewfinder camera with an uncoupled selenium lightmeter. But souped up in a good way. Look at the nice details. 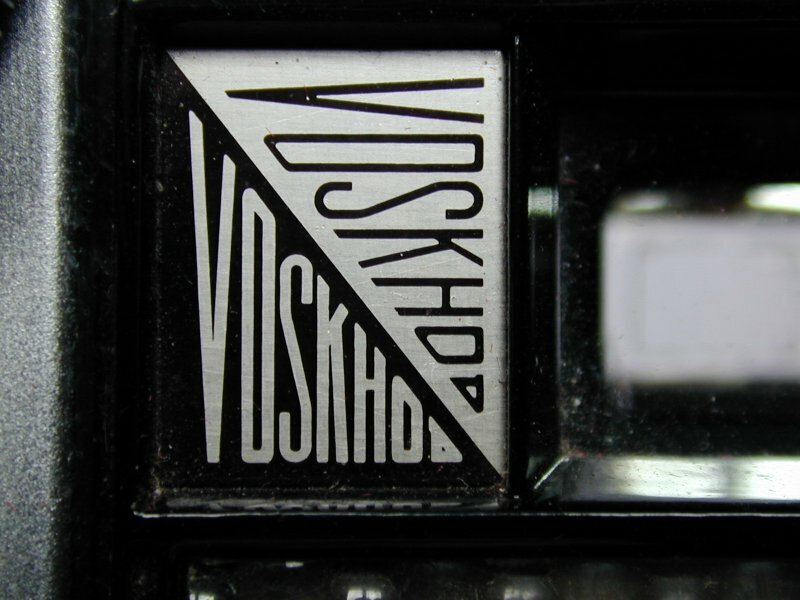 A filmreminder on the front, the design of the advance lever on the top, the cool Logo Voskhod on the right. It is fully in sync with the logos from the sixties of the Soviet Union. The whole camera radiates a kind of Soviet Supremacy. And it comes with a nice brown leather pouch to match. Not an ERC, a pouch, purely some leather to protect the camera from dust. There are some odd things about the design of the Voskhod. To set the speeds and aperture you have to tilt it slightly to the right. The setting scales are not on the top of the lens, like on a normal camera but they seem to have been made in a way that you van easily take portrait shots, a weird but nice way. This is not the only strange thing about the Voskhod, speeds and aperture are to be set manually as it is expected but they are also linked. Dare I say that this little trick is very similar to the Voigtlander Vito series? Yes. Because they are very similar. Except for the tilting of the camera it is the same prinicple. Speed and aperture are on the same ring to set them seperatly you have to push down both the clamps on the ring. Now you might think that this is an awfull way. NO, I say. This is exceptionally handy. Why? Because when you look through the finder you will see the needle, instead of taking the camera away from your eye and pherhaps missing the scene you want to shoot, you simply move the ring untill the meter needle is in the middle again and you take the shot. And on the lensbarrel are the distance icons (tree, group of people and person) that we all know from the later Lomo and the earlier Smena's. This thing was designed for ease of use. Another nice touch on the Voskhod is the lens, allthough it is a humble triplet lens (T-48 2.8/45mm) it is treaded for 40.5 mm filters, which.... yes you guessed it... is the standard size filter for almost all Russian Rangefinders (Fed, Kiev, Zorki). In a way this camera mirrors the turbulent sixties. It is a odd design but you simply have to love this elegant relict from the Soviet Era. And on top of this, this Voskod is fully working. Speeds, 1/30th to 1/250th and B all work. You have to love the design, it is esspecially for the sixties, simply excellent. 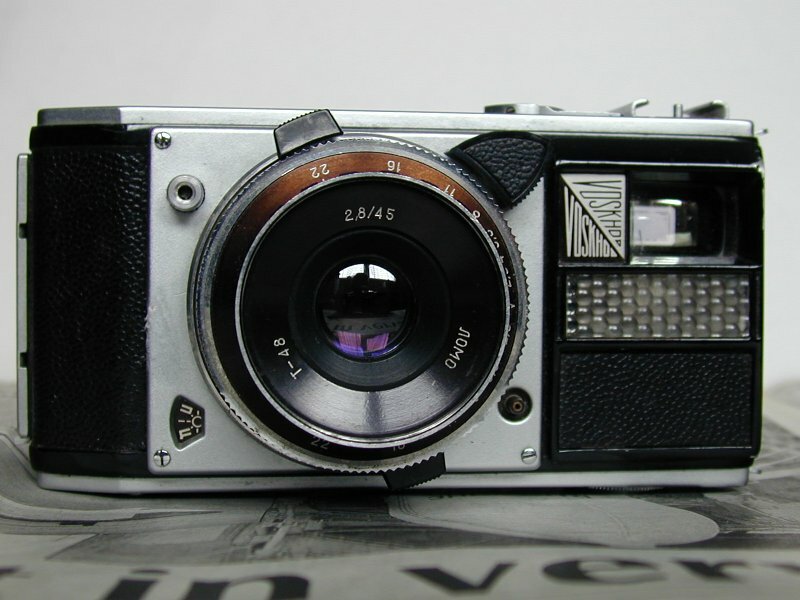 Even though I really miss the rangefinder it has a very bright finder with the needle of the meter in it. It is almost if this camera has been made to show of Soviet workmanship of that day, to simply say how great the USSR was. An elegant, sleek design with delightfull little extras. A design dream.... a true relict of the cold war. From handling it is nice, it is a good snapshot camera and I even will go as far as saying a good streetshooter (this thing is really silent). But the lack of a rangefinder, the selenium cell and the simple triplet lens take it down. Yet this is one of the alltime collectors cameras. A true display camera. Not many Voskhods are left nowadays and it would not suprise me that they will go up in price very fast. I picked up mine from a friend on the Fotografica Fair in Holland, nice price 60 Euros which for a Voskhod is a good price.